Produced by Warner Bros. Animation, the Emmy Award-winning series captured the imaginations of generations, setting the standard for super hero storytelling for the past quarter-century with its innovative designs, near-perfect voice cast and landmark approach to DC’s iconic characters and stories. Batman: The Complete Animated Series Deluxe Limited Edition box set includes all 109 thrilling episodes, plus two bonus disks containing the recently-remastered, fan favorite animated films Batman: Mask of the Phantasm and Batman and Mr. Freeze: SubZero. 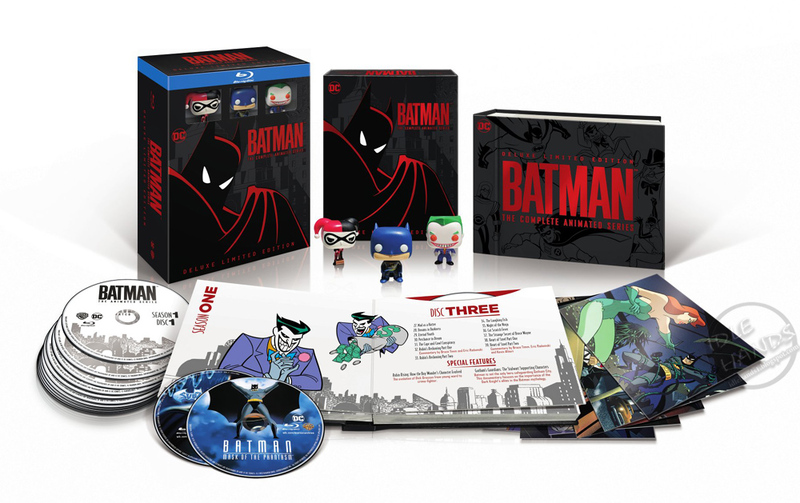 Batman: The Animated Series had a ground-breaking initial run from 1992-1995, garnering a Primetime Emmy Award in 1993 for Outstanding Animated Program, along with three additional Emmy wins and 13 total Emmy nominations. The Batman: The Animated Series cast rivaled that of any animated series in its time. The cast featured actors with laurels totaling one Academy Award, 11 Oscar nominations, 65 Emmy Awards, 283 Emmy nods, 15 Gold Globe Awards, 85 Golden Globe nominations, four Grammy Awards, a Peabody Award, and 17 actors forever honored with stars on the Hollywood Walk of Fame. Arkham Asylum: Examine the Top-Secret Case Files of the Dark Knight’s Many Foes: Ventriloquist and Scarface (Featurette) – Lively discussion about one of Batman’s most unique villains with creators Bruce Timm, Alan Burnett, Eric Radomski, Andrea Romano, and Dan Riba.